Christopher Baccus loves cars and gas station tacos. We find that very attractive. Christopher Baccus is a taco junkie and blogger. Not just any kind of taco, primarily those found in or near gas stations. Last time, he took you there. This week he takes you here. Under a red awning with white lettering reading “El Tacaso”, a red metal curtain covered what looked like an outside order window. Walking up to the Shell mini mart I wasn’t certain the taco stand still existed, but that thought was soon whisked away as I entered and noticed three small tables and a decent line of regulars ordering gorditas, tostadas, and of course tacos. The place is quite nice inside with an exposed kitchen directly behind the cashier. Everything was very neat and a wire rack stood with several fresh ingredients including stacks of tortillas and large bags of onions. 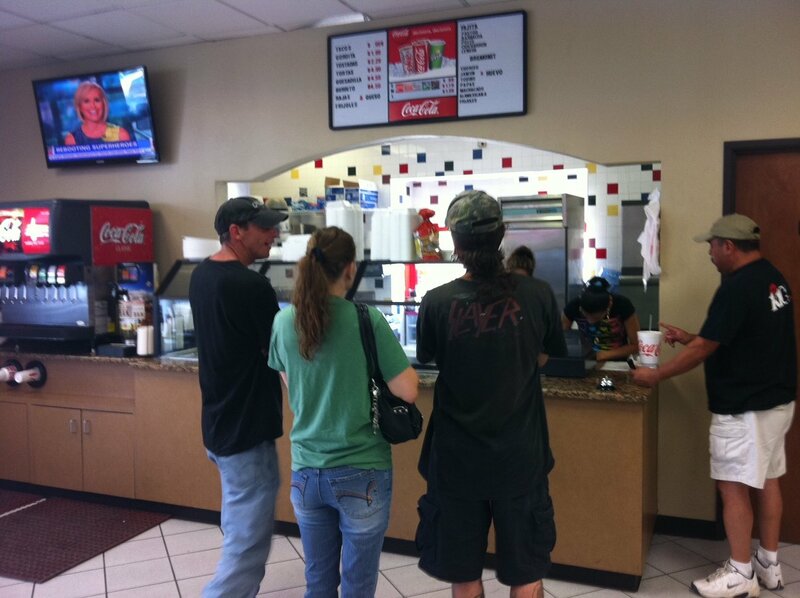 Customers kept pouring in too. Besides Fuel City, this is by far the busiest gas station taqueria I have been to in Dallas. With a steady stream of semi-trucks, Ram trucks and Ford 150s El Tacaso is in a great location active with a bustling customer base who appreciates a great tasting, quick and easy lunch destination. It was quite apparent how many regulars come here daily. For example, as I was placing my order the cashier also took the orders of two people behind me with barely a word exchanged other than a hello and smile as the men proceeded to pay, undoubtedly with exact change. My order of 2 steak fajita, 2 pastor, 1 chicken and 1 barbaco tacos arrived in about 3 minutes placed into a plastic grocery bag. Clearing some of the fatty chunks of meat from the barbacoa I took my first bite. It might have been the 15 minute ride back to my office, but the tortilla was very dry and a bit tough. It was lightly charred. After the third taco, my appreciation for the tortillas improved. The charred tacos made for a more rounded flavor and I started to get why El Tacaso has a regular clientele. The grayish hue aside, the barbacoa meat was quite good. Next the chicken was all lean white meat with some grilled onions mixed in. The two pastor tacos also had grilled onions and except for a couple small pieces of gristle they had a good, though mild, flavor that went best with the charred tortillas. 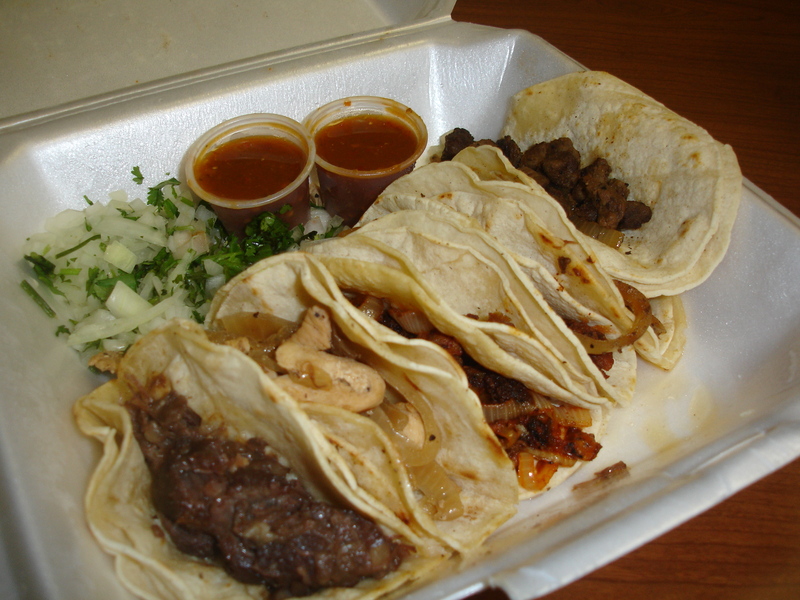 My favorite were the beef fajita tacos. The meat was diced, perfectly cooked and free of fat. Again they too went nicely with the tortillas and with some generous dunks in the salsa roja I ended my meal on a positive. El Tacaso offers something a little different than most gas station taquerias. Their approach to tortillas, while nothing revolutionary or new, is different than the 20 plus places I’ve tried at gas stations. The clean, inviting atmosphere inside and the smile welcoming the place’s regulars shows the pride one can find at a restaurant tucked into the corner of a Shell station mini-market.